A wonderful characteristic of the Kathmandu valley towns and cities is that they are resilient to change. There was a time a few decades ago when the doomsday predictors of the valley went around declaring the end of the Kathmandu valley architecture as we knew it. Today the perception is quite different and quite positive. Bhaktapur is doing really well as a living ‘world heritage city’. The opening of ‘new’ courtyards in the Hanumandhoka palace is a great attraction for visitors and heritage lovers. In Patan, the wonderful and painstaking work being undertaken by the Kathmandu Valley Preservation Trust (KVPT) is very special and encouraging. KVPT has set a high standard on how our heritage should and can be preserved. Everyone looks forward to the day when visitors will be able to see the Tusha Hiti and the water tank, and the gardens in the old palace. One of the things that KVPT has done really well is the documentation of the preservation work, which will hopefully last larger than the monuments themselves. On the same note, one of the greatest milestones in preserving the Kathmandu valley heritage happened when Mr. Niels Gutschow published and launched his three-volume book ‘Newar Architecture’ in Kathmandu amidst a very meaningful program where he thanked all the people who helped him write the books since 1962. It is hard to make a strong argument, but during these politically tough times, documenting our heritage may very well be the most critical thing to do so that we can recover them in better times. 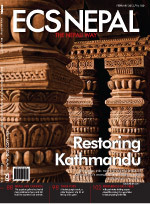 This captured knowledge, combined with the skills and techniques of the artisans will keep Kathmandu a living heritage city for a long time to come. Talking of living heritage cities, from ancient time people have always been fascinated with the world around them and have not stopped wondering how everything was created and how it evolved. If you venture into Thimi and watch the potters and clay artisans at work, you could excused for thinking that everything was first crafted in clay and then ‘brought to life’. People who know how to do this are called the Prajapatis. This month, please take some time out to visit these great people and purchase all the clayware you need for the spring for the house and garden. The new year has brought great news for everyone who loves wildlife and nature as well. In the entire past year, not a single rhino was poached; what a great achievement! Everyone involved deserves a pat on the back and should be acknowledged publicly. Once again, in the early 1970s the doomsday predictors did not give these beautiful animals too many years before they would become extinct. This is the beauty and the thing about Nepal. There is so much negativity and bad news all around if one so chooses. If not, you can choose to focus on what is good and the people who make it all happen. Whatever you are planning to do this month, we hope you will make time for the Nepali way.